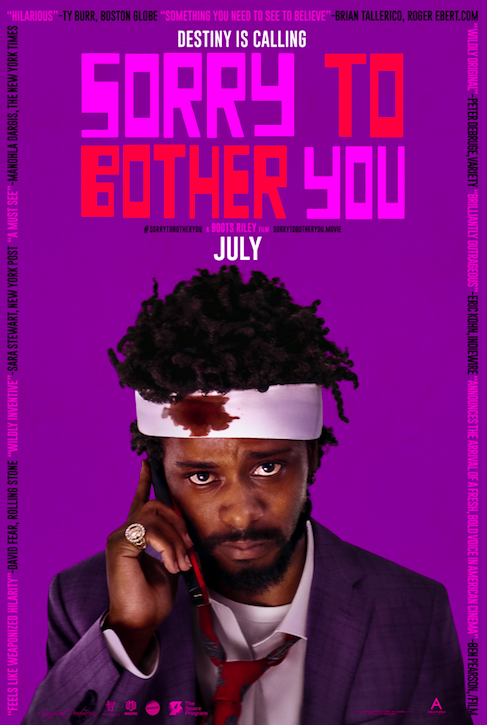 In an alternate present-day version of Oakland, black telemarketer Cassius Green (Lakeith Stanfield) discovers a magical key to professional success, which propels him into a macabre universe of "power- calling" that leads to material glory. But the upswing in Cassius' career raises serious red flags with his girlfriend Detroit (Tessa Thompson), a performance artist and minimum-wage striver who's secretly part of a Banksy-style activist collective. A surreal comedy about rising up and selling out, Sorry to Bother You marks the feature-film debut of Boots Riley — founder and front man of the Bay Area hip-hop collective The Coup — whose evocative story-raps formed the basis for the film's unique, feverishly inventive screenplay. The film also features performances from Omari Hardwick, Jermaine Fowler, Steven Yeun, Danny Glover and Terry Crews, as well as the voice-over talent of Patton Oswalt, David Cross and Rosario Dawson.